Need some help? You're in the right place! Below are the answers to some of our most common questions. If you can't find the answer then you can reach out to us too. How do I access other weeks and tasks using the Apple Watch app? Force touch on the screen to see these options. We’re looking at ways we can make this a little more intuitive in the future too. 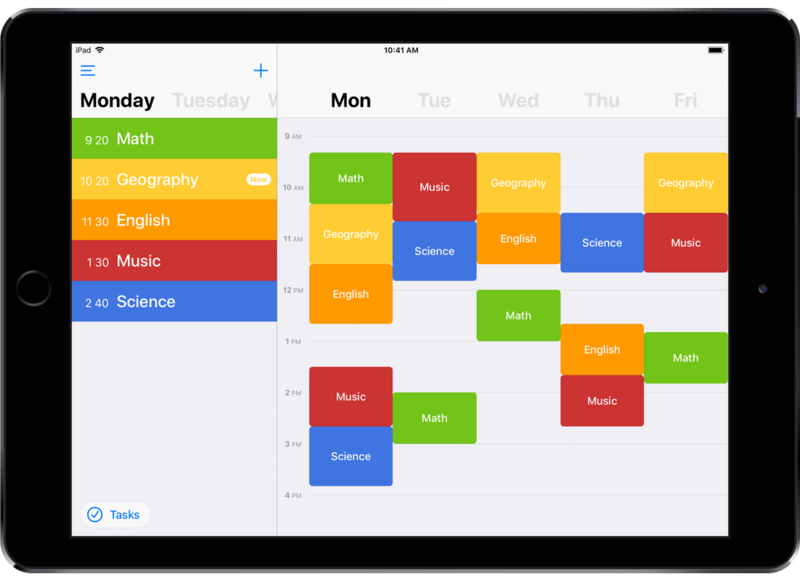 Class Timetable is a free download from both the Google Play and iOS App Store. All essential features are completely free, so you’ll be able to manage your schedule at no cost. There is a paid upgrade that unlocks a few additional features and removes advertising. It’s not very expensive, so if you like using Class Timetable please consider this! I've got a great idea for a feature, can you add it? We get a lot of feature suggestions, but we take the time to read each one. Send us an email and we’ll make sure it gets passed along to the right place. iCloud Sync has stopped working, how do I fix it? There's a few things you need to check, and usually one of these is the problem. Make sure you're using a reliable internet connection, and that you're signed into the same iCloud account on both devices. You'll also need to make sure that iCloud Drive is switched on too. If your Apple Watch has stopped syncing, very occasionally watchOS may prevent sync activity to preserve battery. Reinstalling the watch app is a quick way of solving this. I work in education. Do you offer any plans or resources for integrating Class Timetable into schools? Please get in touch with us, we'd love to talk to you about this. Can I share my Timetable with other users? If you've purchased the Pro Upgrade, you can export your timetable to an image, PDF, or timetable file. The timetable file can be use to backup or share your timetable with others. What features does the Pro Upgrade enable? All essential features are free, however there are some great additional features that the Pro Upgrade unlocks: a landscape calendar display, task reminders, class notifications, and an improved notification widget. You can export your timetable to an image, PDF or timetable file, and we promise that you'll never see ads. Of course, you'll also support the future development of Class Timetable too! Please note that Android does support all listed features at this stage. How much does the Pro Upgrade cost? This depends on your country, but it's roughly the equivalent of $1 USD. That's less than the price of a cup of coffee! Please let us know! We’d love to help.